We’ve all been hearing the …er, buzz… about Google’s new social network, Google+. As someone jaded by the oversharing and overall “bogged down” feeling of Facebook, I jumped on the opportunity to see if Google+ would be any different. It’s still in its early stages, but I’ve been pleased by the tangible steps that Google has taken against oversharing. First, the emphasis on “circles” makes you think about who is going to read what you post. Circles are similar to the optional “list” function on Facebook. But the operative word here is optional. 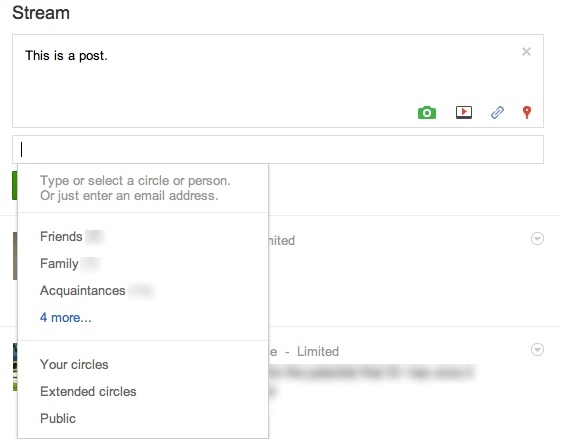 You need to go out of your way to customize who sees your statuses on Facebook, clicking the lock icon next to the “share” button, then going to a “Customize” menu. Clearly, Facebook doesn’t want you to think about who sees your posts. For Google+, on the other hand, at the bottom of each post, you see who the post will be sent to (see below). It’s similar to an email mailing list, except the ensuing discussion looks more like Facebook. Now let’s think about this in the context of a useless post: “I just had some awesome pancakes for breakfast.” It’s on my mind, so on Facebook, I’ll just type it in, hit enter, and it’s there. On Google+, I’ll type it in, then go to select which Circles to share it with. Because of this, I’m forced to ask, “who would care about this?” Acquaintances are immediately unchecked. Family? Nah, they wouldn’t care either. Classmates? No dice. How about “Close Friends”? Come to think of it, why would they care about an above-average breakfast? No one wants to know this, so I’m not going to end up posting it. This is a perfect example of the power of defaults – two networks have the same options, but they feel fundamentally different since one integrates choice into the interface, while the other hides a default. Select who you share with. Second, there is no wall. This is a big move for Google, considering some form of public personal messaging has been a staple of both MySpace and Facebook, its precursors. There’s a complex psychology and sociology to the Facebook wall, but it just starts feeling weird after a while. It’s akin to people holding a loud conversation in public – you don’t necessarily want to eavesdrop, but you can’t quite avoid doing it. On Google+, if you want to direct a message at someone, you have two options. First, you can make a post that you share only with the intended recipient; the person will get a notification about your post. This is a bit odd, though, since it only appears in your “stream” along with posts not specifically directed at anyone. Second, just email the person. Depending on various privacy settings and whether you are Gmail contacts, Google+ profiles have an email link featured prominently under the profile picture. (Edit: You can control whether this link appears by going to your profile, then clicking “Edit Profile,” then the “Send an Email” icon. When people click this link, they send you an email without actually seeing your email address.) Either way, you’re encouraged to keep two-person conversations private. It might seem surprising that the folks who brought us the Buzz disaster would discourage us from sharing too much, but they’ve clearly focused their network around what people don’t like about Facebook (and perhaps they’re trying to avoid the backlash they got from Buzz). Facebook has become inundated with information you never wanted to know from people you met once and became friends with out of politeness. Even to many people who are “hooked,” Facebook has become more of a social burden than a welcome way to keep in touch with friends. It’s hard to predict how Google+ will evolve as it scales up and is modified over time – after all, Facebook was once somewhat similar to the current Google+, but it incrementally eroded privacy to draw users in. However, Google has an advantage that Facebook didn’t have. It is already an established web resource with enough useful services independent of its social network to keep itself relevant for a good while. Google can continue to attract users by making Google a one-stop digital resource, leaving an unobtrusive social network intact. Addendum: I should probably note that the “resharing” function leaves a privacy hole, but resharing itself requires that you think about who would want so see someone else’s post. Though it amounts to no more than automated copy and paste, this is another example of the power of defaults; hopefully Google will allow users to turn off resharing by default before Google+ becomes open. In general, the Google+ design allows you to limit the people you give information to, not what they do with it, which is really all you can hope for, anyway (see Hoffa v United States). Posted in Anonymity & Online Identity, Control, Privacy, & Technology, Privacy in a Web 2.0 World, Privacy: Who Can You Trust?